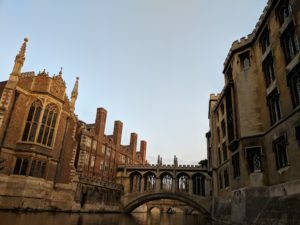 Researchers from the Crow team have returned to the 2018 Teaching and Language Corpora (TaLC) conference in Cambridge, England, to update the TaLC community on the progress we’ve made since our last appearance. Team members (Ola Swatek, Hadi Banat, and Shelley Staples) had previously attended the 12th TaLC conference in 2016 to present our plans for developing the Crow platform, and this year we were actually able to debut the working prototype. This year approximately 25 conference delegates (as the local organizers called us) had the opportunity to attend our half-day workshop titled “Exploring variation and intertextuality in L2 undergraduate writing in English: Using the Corpus and Repository of Writing online platform for research and teaching.” The team guiding the workshop participants consisted of Adriana Picoral and Dr. Shelley Staples from the University of Arizona, alongside the following graduate students from Purdue University: Ji-young Shin, Aleksandra/Ola Swatek, and Zhaozhe Wang. Mark Fullmer joined us virtually from Tucson, Arizona. 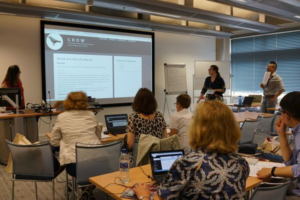 The purpose of the workshop was to test out the Crow online interface with users who have never used it and collect user feedback from them. This was the first time that researchers and teachers outside of Crow had a chance to try the Crow online platform. 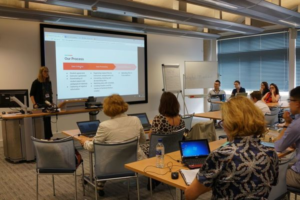 This workshop provided us with the opportunity to get practical feedback from some of our target audience on the usability of Crow platform before our public release. As we were preparing for the workshop, we discussed how different the audience at this conference might be from audiences at conferences in the United States. The data for our project is currently collected from first-year writing courses at our U.S. institutions. These courses could be unfamiliar to European audiences, which made it particularly important to describe the purpose of these courses to the audience. The workshop began with Dr. Staples’ introducing the project to the attendees, who were mostly unfamiliar with our data and the educational context from which the data comes. The introduction was followed by more hands-on activities since we are strong believers in the learning by doing approach. We have scaffolded our exercises to move from simple to more advanced functions so we promoted step-by-step, spiral learning. Ola started the first activity by introducing corpus search function, and Adriana, Zhaozhe, and Ji-young guided the other activities one by one. Each time we were done with a part of the workshop, our team asked the participants to write down feedback related to a particular functionality of our interface. Such feedback was one of the key reasons we decided to beta-test the interface with this particular group of users. The workshop attendees, most of whom are fairly used to navigating other corpora interfaces, are one of the target users of our platform. During our workshop, the attendees asked many important questions about the current and future design of the Crow platform. These questions gave us insights into what some of our users might be interested in seeing the platform do in the future. Of particular interest were the search functions and the possibility to download corpus data with rich metadata. 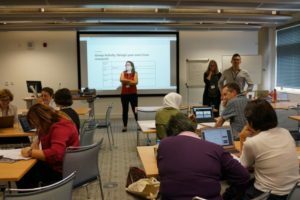 Workshop participants noted that the search engine was “easy to use,” “intuitive,” and “accessible”—promising feedback, considering that we want our tool to be used not only by researchers but by teachers as well. 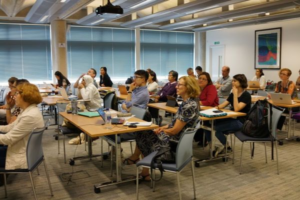 Also, audience members indicated interest in intertextuality opportunities offered by the link between repository and corresponding corpus materials for both research and pedagogical purposes. Most corpus tools publicly available don’t cater to teachers as audience; though this particular audience could certainly benefit from a clear and accessible corpora of classroom materials, they don’t always have the training necessary to navigate research-based corpus tools. Attendees also reportedly enjoyed the design of the landing page, as well as the detailed nature of the repository and its interlinked documents. We also gathered valuable feedback on what the audience would like to see improved in the platform. Among some of the suggestions was distinguishing corpus and repository interfaces with color scheme, improving the concordancing view, changing the font size and color, improving the search function. There were many more comments added in the survey we conducted and we plan to use that knowledge to make the interface as user friendly as possible. The TaLC experience was not only focused on academic interactions. The city of Cambridge has much to offer in terms of its beautiful scenery, rich history, and unique culture. 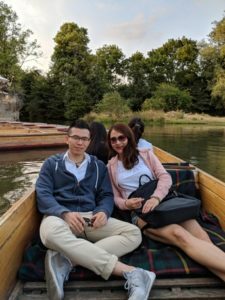 Graduate students of our team went on a punting tour and got to learn the cultural and social history behind the most prominent colleges and their students at Cambridge University. It was a truly memorable experience. 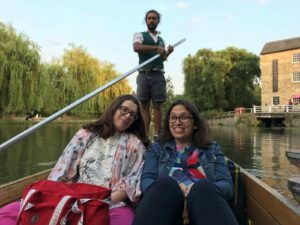 Here’s a video prepared by the organizers showing what you’ve missed, if you haven’t attended the Teaching and Language Corpora conference.